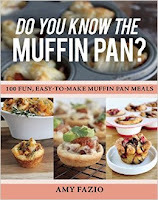 The Halifax Reader - Halifax Public Libraries: Staff Pick: Do you know the muffin pan? Staff Pick: Do you know the muffin pan? It's easy to get lost in the cookbook section on the fourth floor of the Halifax Central Library. I try to avoid walking through it unless I'm specifically looking for cookbooks, because I always leave the area feeling ravenous and with a heavy armful of beautifully photographed recipe books I simply must take home. On my last trip to where the cookbooks live I was looking for some inspiration on appetizers to serve at an upcoming book club night at my home. The punny title of Amy Fazio's Do you know the muffin pan? : 100 fun, easy-to-make muffin pan meals happened to catch my eye. When I pulled it off the shelf and leafed through it I was immediately hooked by the scrumptious pictures of various goodies all made in tidy little muffin-size portions. It looked so promising I was able to restrain myself from my usual habit of taking out 3 other cookbooks at the same time, just in case the first one didn't work out. I wasn't disappointed. The book is divided into different sections: breakfast, appetizers, side dishes, main dishes, and dessert. It was difficult to choose which ones we wanted to make, everything looked so tempting. For book club night we settled on two different recipes, on sweet and one savoury. French onion soup dumplings were very easy to make with some grocery store puff pastry for the crust, gruyere cheese and carmelized onions all baked in the oven for 10 minutes. The sweet was a twist on one of my favourite treats: home made peanut butter cups with dark chocolate and caramel sauce, topped with sea salt. They elicited "wow"s from all who tried them! Some other recipes I want to try from this book include: Salami boats with antipasto salad, Eggs Benedict casserole cups, and all of the items involving pretzels. At breakfast the day of our book club my three little boys noticed the book and inspected every single page, making their own list of recipes to try. They were especially interested in the Pretzel Dog dippers with beer cheese dip. My middle son was so impressed by the book he declared that he would buy it when he grows up and moves out, because he could live on just these recipes. He really loves food, so I consider that high praise indeed. If you'd like to try out some of Amy Fazio's recipes you can also find many of them on her Do you know the muffin pan blog. 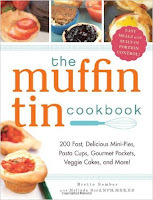 For other muffin pan ideas try: The muffin tin cookbook by Brette Sember with Melinda Boyd.